When computers first began widely appearing in hospital rooms and physician clinics, it was clear that big changes were coming for the practice of medicine. Many physicians viewed the changes with trepidation. For some, new technology meant new headaches — learning software, purchasing expensive machinery, becoming proficient at typing. Dr. Tom Landholt. Photo by Bruce Stidham. But where some physicians saw hurdles, Tom Landholt, M.D., saw an opportunity. 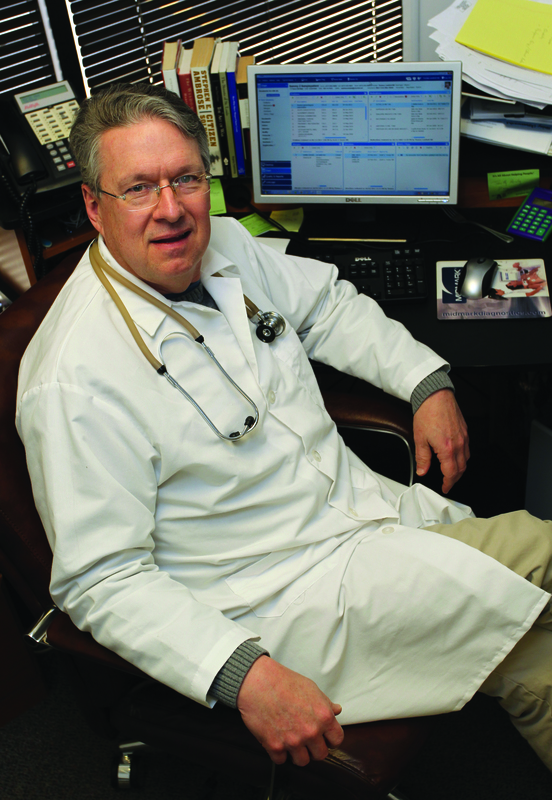 Dr. Landholt, of Springfield, envisioned how medical providers could use the new technology to work more efficiently. He thought that going electronic could make the practice of medicine faster, cheaper and lead to happier patients. At the time, Dr. Landholt was employed by a large health system. He knew it would take years for his employer to make the transition. So, sensing an opportunity, he struck out on his own. He established a private clinic in Springfield with a business plan centered on using computer technology to its fullest extent. That kind of entrepreneurial spirit was common among physicians when Dr. Landholt first opened his PatientCare Family Clinic. At that time, many physicians worked in dual roles — using their medical skills to help patients while also managing their clinics like a small business. Instead of wearing two hats, doctors wore two jackets: The white lab coat and the dark business blazer. But today, there are fewer small private physician clinics. Doctors are less likely to choose the path of the entrepreneur. Yet, private practice is far from going on life support. And for physicians who choose this route, great opportunities remain. In the 1970s, before Dr. Landholt was “Dr.” Landholt, he was Tom, the manager of Steak & Ale, a steakhouse and bar on Springfield’s business strip. While the hours were long and demanding, he loved the job. “It didn’t really even feel like work,” he said. The experience he gained as a restaurant manager was invaluable. He learned how to lead a staff, maintain a facility and deal with all the technical and human issues that arise in food service. Most of all, he discovered how to take care of his customers so they had a great experience and wanted to return. Eventually, he realized that restaurant management wasn’t the career he wanted for his future. He chose to become a physician because it would allow him to connect with community members — he loved that aspect of restaurant work — and because he knew medicine would be mentally stimulating. He studied at the University of Missouri School of Medicine before returning to Springfield to complete his residency at CoxHealth. When he became inspired to start his own practice, he was excited to put his restaurant experience to work. “Having that background certainly colored my perceptions of how the clinic ought to be run,” he said. Today, Dr. Landholt runs his clinic with his partner, Dr. Scott Turner, MD. They employ two nurse practitioners and six support staff, handling approximately 10,000 patient visits each year. Along with personally seeing about 25 patients each day, Dr. Landholt said he spends 8-10 hours managing the clinic each week. He enjoys both roles. Along with focusing on great care, his business management background helps him keep turnover low and business growing. Even as Dr. Landholt’s clinic grew over the years, more and more physicians in Springfield were leaving private practice in favor of becoming employed by hospitals. Tom Holloway, executive vice president at the Missouri State Medical Association, said the trend extends well beyond Springfield. In a nationwide study released last fall, the American Medical Association found that the number physicians who own their clinics declined by 8 percent over the last five years. Likewise, physicians practicing solo declined by 6 percent during that time. The assumption is that these physicians are leaving private practice to become employed by a hospital or health system. While hard data for Missouri doesn’t yet exist, Holloway estimates physicians are choosing moving toward employment at a rate of 4-5 percent each year. There are several reasons behind the trend. Hospitals and health systems feel compelled to employ physicians in order to grow or maintain market share. Having more physicians on staff ensures there is a steady stream of patients using hospital services. Health systems also want more physicians on staff to gain leverage in negotiations with insurers and enhance savings with larger economies of scale. Likewise, today’s physicians are enticed to seek out employment due to pressures such as huge medical school debt, a lack of business training and the convenience of having a schedule that more closely resembles a standard work week. On top of this, growing government regulation and the complexity of insurance contracts — Dr. Landholt said his clinic tracks nearly 500 different insurance plans, each with separate rules — makes choosing the route of the private small business all the more difficult. Even with the move toward employment, the American Medical Association study found that 53 percent of physicians are still self-employed. “To paraphrase Mark Twain, the reports of the death of private practice medicine have been greatly exaggerated,” said Ardis Dee Hovin, M.D., president of the American Medical Association. Those physicians who continue to maintain their practices as private businesses benefit from having control over their practice. For Dr. Landholt, maintaining autonomy has allowed him to respond to the changing Springfield market and grow his practice. PatientCare Family Clinic is organized as a limited liability company. Like other small companies, its owners have an evolving strategy. For instance, the clinic has noticed that many of their customers are working mothers who want quick care for their sick children. As they sought help around town, these mothers were disappointed in having to wait days or even weeks to see their family doctors. Again, sensing an opportunity — and wanting to better meet this need — Dr. Landholt’s clinic gives schedulers greater freedom to converse with patients and determine the best time for the appointment. “It turns out that a well-trained person answering the phone, taking clues from the patient, can really set up a very efficient schedule as the day progresses, and it reflects the needs of the patients on that day,” he said. 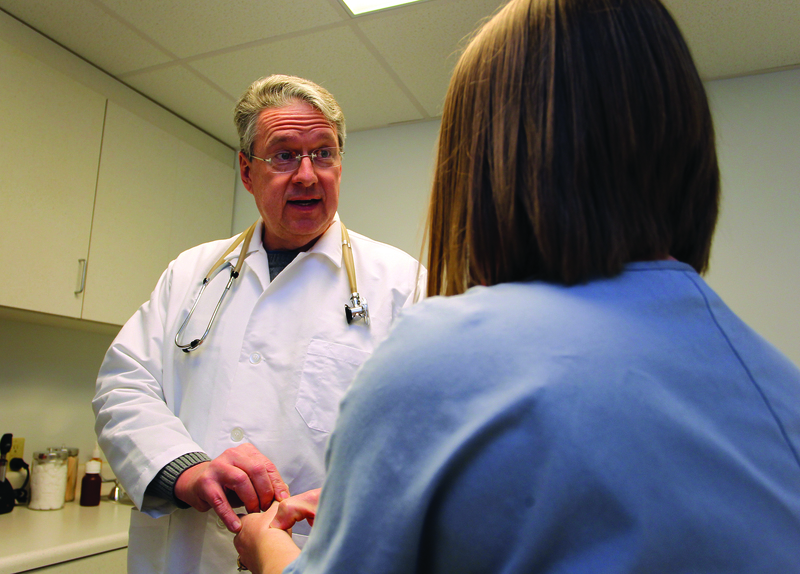 The strategy has allowed his clinic to see 90 percent of patients on the day they call. Operating his clinic as a small business is what has allowed it to stay on top of market trends like this. Change can happen quickly. That kind of freedom is why it’s unlikely the physician entrepreneur will disappear anytime soon. Many observers agree. While the trend toward doctors leaving private business may continue into the foreseeable future, eventually it may reverse or find a balance. It’s also possible that new models could develop allowing physicians to partner more closely with hospitals, receive some of the management benefits while still remaining independent. Having seen the value of computerization in his own practice, Dr. Landholt also hopes that new software will be developed making it easier for physicians without business training to operate independently. Either way, like any business, the key will providing a great product that continues to attract customers.